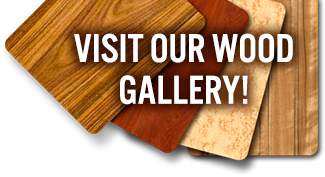 Foreign and domestic veneers, minimum 1/50" (0.5 mm) thick at 12% moisture content. TruGrade, AWI or WDMA face grades. Plastic Laminate or Medium Density Overlay (MDO). 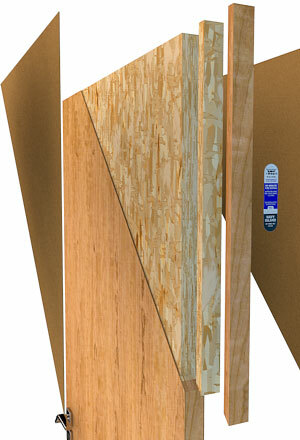 Structural Composite Lumber (SCL) with a density of 38-lbs/cubic foot (609-kg/cu mm). HD.1 edge style- Matching 5/8" (16mm) hardwood laminated to 7/8" (22 mm) SCL. VE.1 edge style- Matching veneer edgebanding laminated to 1-3/8" (35 mm) SCL. Optional, please specify if required. Water resistant. Urea Formaldehyde Free. Book/running match standard. Slip or random match optional. Balance, Center, Random, Sketchface and Blueprint Matching available. Non-rated: Sizes up to minimum margin. Warrantied up to half of door height. Factory finish meets or exceeds WDMA TR-6 and AWI 1500 standards. Available in standard or custom stains.